First and foremost, We apologize for the confusion and last minute change with the webinar. It was set to go and logged in then the internet dropped the group meeting. The meeting site automatically marked the meeting as over. We sent out e-mails with the new URL for the group meeting but it took time. Thank you for your patience with this new platform. Although far reaching, it comes with downsides and hopefully we can make this a long term way to reach our patients. Lesson learned, don’t rely on wireless internet access for webinars. The Anemia slides will be added to our website dssurgery.com soon. Ferritin is a protein that acts like your savings account. It’s like a holding tank. When you have a blood loss your body goes to Ferritin stores for iron to increase red blood cell production. Iron is like money in your pocket. For small and daily building of red blood cells. Transferrin is a protein transport that carries the iron. Copper is also needed to transport iron. Iron can be readily available but will not be utilized unless your protein levels are adequate. The protein level on laboratory studies needs to be at least 6 gm/dL & Albumin 3.2 gm/dL for adequate iron utilization. Vitamin B12 also is needed for iron utilization. Iron metabolism in the DS patient is limited due to several factors. In unaltered anatomy Iron enters the stomach where it is exposed to acid and changes into a form which allows it to be absorbed. Then it enters the duodenum which is the chief area of the small intestines where iron absorption takes place. There is possibly a second minor site of absorption near the end of the ileum. However, after the DS there is a small portion of the duodenum that is left after the pyloric value for iron absorption. Below is a list of iron rich foods. Also remember to take Vitamin C with your iron supplements and when eating plant based iron rich foods add a food that is high in Vitamin C.
There was a brief discussion regarding Calcium oxalate kidney stones. That talk can be found on our website. Treatment is limiting oxalate containing foods and to increase calcium supplements to 3,000mg daily but to take half with food and the other half without food. Also Vitamin K2 can also decrease kidney stones. Fissures where also briefly discussed. Fissures are most likely caused by the unopposed bile salts entering the colon after DS. Bile is alkaline and causes irritation to the mucosa. Treatment is liberal use of barrier type creams/ointments, controlling loose stools by watching if certain food items cause them or by using fiber with half the liquid mixed with it. The fiber with less liquid acts as a sponge to give more form to the stool. We had anemia themed snacks at the live group meeting. Pate, Southwest ground Bison, and a Mayan Pumpkin seed dip. Here is the information on the nutritional value of Bison versus other meats. It is higher in iron and Vitamin B12 and lower in fat and cholesterol. This chart shows the amount of total iron in food. Iron from most animal sources (heme iron) usually is more readily absorbed than iron from plant sources of food (non-heme iron). Include a source of vitamin C or heme iron to improve the absorption of non-heme iron. *The amount varies. Read the Nutrition Facts panel on food labels. From: The American Dietetic Association’s COMPLETE FOOD & NUTRITION GUIDE, 2nd ed. 2002. Iron Deficiency Anemia is a common problem in society and weight loss surgical patients. Anemia is usually easily treatable, although requires adequate surveillance and diligence in treatment. Microcytic/hypochromic (small pale colored red blood cells) erythrocytes indicate some inadequacy of structural matter, usually, not enough hemoglobin. This is most commonly due to an inadequate dietary supply of iron. In fact, iron deficiency anemia is the most common of all anemias. Determining the cause of the iron deficiency is of pivotal importance in selecting appropriate therapy. Microcytic/hypochromic erythrocytes may also be seen in anemia of chronic disease, in thalassemia and in the sideroblastic anemias. Blood loss is the most common cause of iron deficiency. Menstruation is the most likely reason in women ages 15 to 45 years. Iron deficiency anemia in adult men and postmenopausal women is most likely due to chronic gastrointestinal blood loss. Such losses are usually secondary to ulcerating lesions [peptic ulcer disease, mucosal trauma (hiatal hernias), drug ingestion (aspirin, nonsteroidal anti-inflammatory drugs, steroids, potassium), parasitic infections, inflammatory bowel disease and malignancy. Undergoing several surgeries within a short time frame is also a source of blood loss. 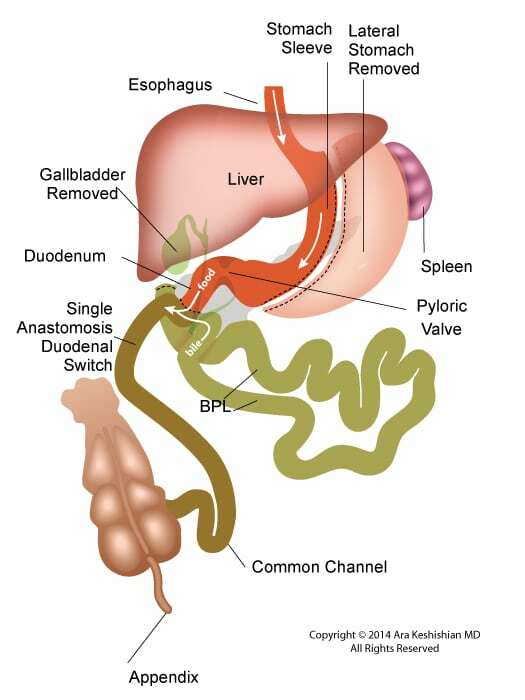 Frequently Duodenal Switch (DS) patients become anemic after their panniculectomy, breast reductions, arm or thigh lifts because of the short interval between operations. Also pregnancy after weight loss surgery can increase chances of developing iron deficiency anemia. After consecutive surgeries it is important to monitor your Iron, Ferritin and Transferrin, Total Iron Binding Capacity levels. Any drop in Ferritin or Transferin levels should be discussed with your DS surgeon. It is important to keep your levels with in normal limits because it can be challenging to bring these levels back up.Lack of dietary iron may cause anemia in infancy when the daily need for iron is not met by milk alone. This is why iron supplements are given to infants. Iron deficiency is a major cause of anemia in pregnancy. Malabsorption of iron is a rare cause of iron deficiency in the general public but is seen in patients who have had a partial gastrectomy, RNY Gastric Bypass, or who have a surgical malabsorption, such as Duodenal Switch. Iron is absorbed through the duodenum and the first part of the jejunum. After DS there is only a small section (approximately 5cm) of the duodenum that comes into contact with the iron source in the GI tract. The remainder of duodenum and the jejunum after DS is now the biliopancreatic limb. There is an area of small intestine in the ileum that also absorb iron to a lesser degree in normal anatomy. Ferritin is in essence an “iron buffer”, taking up excess iron or releasing iron as needed. Small amounts of ferritin, derived from iron stores, circulate in the plasma. The amount of serum ferritin closely reflects iron stores, thus providing a readily measured assessment of body iron stores. 3) ferritin may be increased in malignancy. Ferritin is in essence an “iron buffer”, taking up excess iron or releasing iron as needed. Small amounts of ferritin, derived from iron stores, circulate in the plasma. The amount of serum ferritin closely reflects iron stores, thus providing a readily measured assessment of body iron stores. Transferrin, the major iron transport protein, is synthesized by the liver and macrophages (type of blood cell). Each molecule of transferrin can bind two at- oms of iron. Usually about one-third (25 – 45%) of the total transferrin is bound to iron (referred to as % saturation)Transferrin carries iron via plasma to cells throughtout the body, though the most important site of delivery is to the mar- row erythroblast. Non-heme iron (mainly Fe +++(Iron) ) is stabilized by gastric HCl; bound to mucin and then transferred to a mucosal cell surface receptor. Most heme iron is catabolized to Fe ++ (Iron) and tetrapyrrole in the mucosal cell. In the mucosal cell the iron is bound to mobilferrin, transported through the cell to the submucosal capillary network where the iron is oxidized to Fe+++, bound to transferrin and delivered via the blood to the marrow and other tissues. Note that some iron is stored or “trapped” as ferritin in the mucosal cell. This “trapped” iron plays only a minor role in regulation of iron intake/loss as it is readily overwhelmed by ingestion of inorganic iron. Total Iron Binding Capacity approximates a measure of transferrin. Serum iron is a measure of Fe bound to transferrin. Normally 25 – 45% of transferrin is bound to iron, ie. The % saturation of transferrin. In inflammatory and malignant conditions transferrin is decreased possibly due to macrophage degradation. Iron is decreased due to decreased release of iron from macrophages into the plasma. Iron deficiency is best screened for with serum ferritin levels (serum ferritin levels correspond to marrow stores). A serum ferritin of 12-307 ng/ml is the normal range. The definitive test for iron deficiency is a Prussian blue stained bone marrow. The upper image demonstrates an absence of iron in the bone marrow macro-phages of an individual with iron deficiency. Compare the upper image with the lower image of a normal bone marrow stained with Prussian blue and demonstrating coarse granular storage iron in macrophages. Normal results for TIBC are 250 to 450 mcg/dL for men and women. Iron is continually conserved and recycled for use in heme and non-heme enzymes. About 1 to 2 mg of iron are lost each day to sloughing of skin and mucosal cells of the gastrointestinal and genitouretal tracts. This obligate iron loss is balanced by iron absorption from the gastrointestinal tract. Only a small fraction of the 4 grams of body iron circulate as part of transferrin at any given time. Body iron is most prominently represented in hemoglobin and in ferritin. There are different oral iron formulations available. I recommend heme iron instead of ferrous sulfate or ferrous fumarate. After 3 months of therapy it is necessary to repeat laboratory blood levels to determine the next course of action. Iron supplements along other medications should be stored away from children in “child proof” containers. Your pharmacist will be able to instruct you with the correct way of taking the iron supplements, and possible interference with other medications that you may be taking. In severe anemia and/or iron deficiencies anemias resistant to oral iron supplementation, it may be necessary to have iron injections or infusions intravenously. If you have any questions please contact us either by email or phone. In summary, iron deficiency anemia develops gradually. It also takes a great deal of time to build iron levels back up again. The importance of continued surveillance of laboratory studies is crucial after weight loss surgery. In addition, the treatment of iron deficiency anemia requires diligence in taking the iron supplement or reacting to the inability to absorb oral iron supplements by using iron infusions. Please contact our office if you have not had your yearly lab work or you may have your primary care physician order these studies.